With a multimedia practice extending over 40 years, Susan Hiller was one of the most influential artists of her generation. Since first making innovative use of audio and visual technology in the early 1980s, her groundbreaking installations, multi-screen videos and audio works have achieved international recognition. 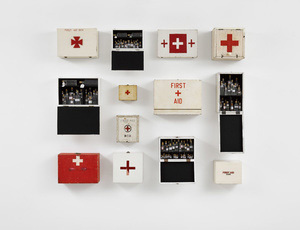 Each of Hiller’s works is based on specific cultural artefacts from our society, which are used as basic materials. Many pieces explore the liminality of certain phenomena including the practice of automatic writing (Sisters of Menon, 1972/79), near death experiences (Channels, 2013) and collective experiences of unconscious, subconscious and paranormal activity (Belshazzar’s Feast, 1983-4; Psi Girls, 1999; Witness, 2000). Hiller’s powerful and resonant films range from the J Street Project (2002-05), a chillingly extensive search for every street sign in Germany bearing the word Juden (Jew), to The Last Silent Movie (2007), which also documents disappearance and absence, although this time through speech recordings of dying or extinct languages. Her psychologically charged and thematically varied practice amounts to an impassioned plea for the joys and mysteries associated with irrationality. 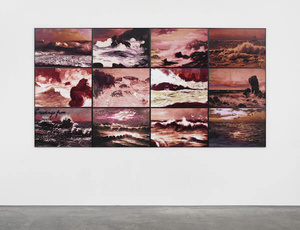 Susan Hiller (1940-2019) was born in Tallahasse, Florida, and was based mainly in London since the early 1960s. After studying film and photography at The Cooper Union and archaeology and linguistics at Hunter College in New York, Hiller went on to a National Science Foundation fellowship in anthropology at Tulane University in New Orleans. Her career has been recognised by survey exhibitions at The Polygon, Vancouver, Canada (2018); Officine Grande Riparazioni, Turin, Italy (2018); Pérez Art Museum Miami, Miami, FL, USA (2017); Samstag Foundation, Copenhagen, Denmark (2014); Musée d’Art Moderne et Contemporain, Toulouse, France (2014); Tate Britain, London, UK (2011); Moderna Museet, Stockholm, Sweden (2007); Castello di Rivoli, Turin, Italy (2006); Museu Serralves, Porto, Portugal (2004); ICA, Philadelphia, PA, USA (1998); and ICA, London, UK (1986). Hiller's work features in numerous international private and public collections including the Centre Pompidou, Paris, France; Ludwig Museum, Cologne, Germany; Museum of Modern Art, New York, NY, USA; Tate Gallery, London, UK and the Centro de Arte Contemporanea Inhotim, Brumadinho, Brazil. Pencil on paper under blue perspex (1975); typescript and water colour on blue paper (1981) 64 x 91 cm / 25 3/16 x 35 13/16 in. Archival dry prints 51 x 76 cm each / 20 1/8 x 30 in. Single channel projection, with sound 30 minutes. Edwardian mahogany cabinet with lock and key, glass-fronted, containing 30 bottles of water collected from sacred springs, holy wells, etc. 16 x 22.9 x 27.9 cm / 6 1/4 x 9 x 11 in. 5 channel video projection with sound,synchronised, 15 minutes, each projected image approx. 266 x 355 cm / 104 3/4 x 139 3/4 in. Ashes of paintings burned annually, glass measuring tubes, glass containers, lead date tags, cotton steel 71 x 258 x 24 cm / 27 15/16 x 101 9/16 x 9 7/16 in.